Georges Nicolas Toussaint Augustin (Augustin Dubourg), Lady as Diana, c.1780-5. 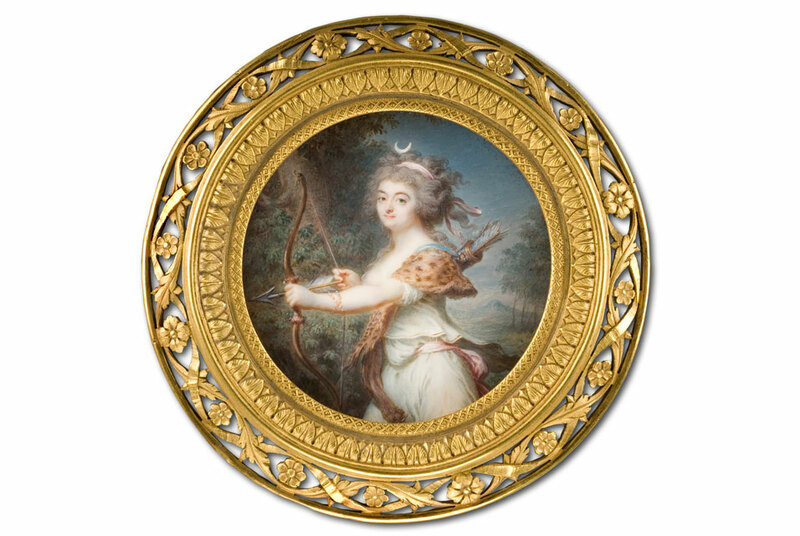 Watercolour on ivory, Diameter 6.9 cm. 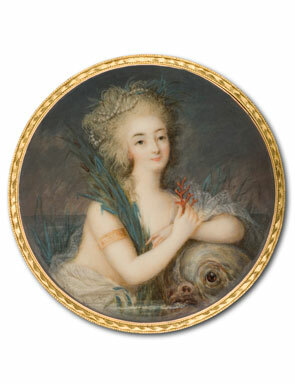 LONDON.- A Vestal Virgin, the Holy Roman Emperor, a baby in a basket, a man with a harp and even the grand, decadent, indisputable “Reine” herself, Queen Mary Antoinette can all be found at; Miniatures from the Time of Marie Antoinette at Philip Mould & Co Gallery, 7-13th November 2012. This exhibition displays the most eminent and indulgent characters of the eighteenth-century French aristocracy. Highlights include an image of Marie Antoinette by court painter Ignazio Pio Vittoriano Campana and Holy Roman Emperor Joseph II, by Adam Ludwug d’Argent. This internationally celebrated collection is kept under lock and key in Germany for most of the time; this exhibition presents an extremely rare opportunity to view it in London. Coinciding with the launch of the volume “The Tansey Collection: Miniatures from the Time of Marie Antoinette”, the portraits selected for the exhibition were all made to reflect the books theme. The Tansey Collection is a keystone of miniature portraiture, with the exhibition book as the fifth in a chronological series cataloguing one of the world’s largest and most representative collection of miniatures. All the leading masters are represented at Philip Mould & Co’s week-long exhibition: Augustin, Dumont, Périn, Pasquier, Rouvier, Lemoine, Mosnier, Sauvage, Le Tellier, Sicardi and Vestier, to name but a few. The foreign artists who achieved fame in Paris and are therefore often regarded as belonging to the French school included Campana – an Italian, Hall – a Swede, and Sené and Thouron from Switzerland. Revealed through the medium of the fashionable, but private portrait miniature; the flattered officials, devoted loved ones, eccentric aggrandisers and adored children constitute a unique and unconventional exhibition of characters. Meticulously rendered and often encrusted with insignia and jewels, portrait miniatures, were popular and modish. Miniature painting peaked in terms of artistic accomplishment and popularity in the period on show – just years before the momentous collapse of the Ancien Régime. Popular too, across the arts, portrait miniatures inspired playwrights, poets and authors of the day. The innovations of the day included painting on new materials with a variety of brushwork, widespread aristocratic patronage and emotional expressiveness of the subjects. As such, the years of Marie Antoinette’s reign are recognised as the height of miniature painting and are beautifully encapsulated in this exhibition. Visitors will delight in the refined aesthetic creations, the seductive ladies and elegant gentlemen, and immerse themselves in a time long past from this fascinating period of French history. Emma Rutherford is a freelance art historian specialising in portrait miniatures and silhouettes. She set up the Portrait Miniature Department at Phillip’s Auctioneers. After the amalgamation of Phillips and Bonhams she became Departmental Director. During her time in the auction world, she sourced and handled the Albion Collection, the highest grossing collection of portrait miniatures ever to come to come to the market. She has also curated the family collection of portrait miniatures, entitled Heirs and Graces, at Harewood House in Yorkshire. Emma has recently completed her first book, entitled “Silhouette; the Art of the Shadow,” which is now available from bookstores. Emma recently curated the ‘Secret Faces’ exhibition at Philip Mould & Co, an important exhibition of rarely seen portrait miniatures from public and private collections.